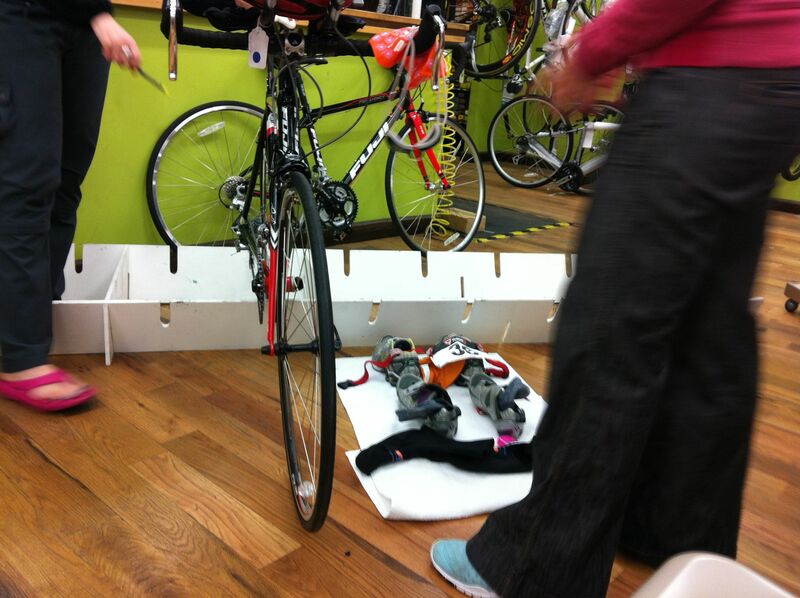 Last night, I attended “Newbie Night” at Quad Cycles in Arlington. It was hosted by 3 Max Performance race directors (one being my favorite A.R.T. specialist from Active Release Boston! ), and covered everything from transition set-up, to race start times, to nutrition. Most of it was specific to the Season Opener triathlon in 1.5 weeks, but a lot of it can be applied to any triathlon. Triathlons in May can be cold! Especially on the swim. Wetsuits are required for this race, and booties and double caps are allowed. Transition space set up – you can set up your bike anywhere in the row that includes your number. Ends are best! For this race, the way the racks are set up and because the bike starts on an uphill, it is best to put your bike on the smaller gear in the front. Swim sighting – most people have a dominant side when they swim which means you will swim crooked, so you want to look up every once in a while to check that you are heading in the right direction towards the buoys. Here’s a good video tutorial about how to sight. There were tons of other details about the race and triathlon covered in the session. I would definitely suggest going to “Newbie Night” if you have a chance! They have another one on May 31 for those of you who are local. What advice would you give to a newbie triathlete? Can’t wait to hear about your tri!!! !